KTD-BD-CR2 - K-Tuned Shifter Solutions - Pro-Circuit 2 Shifter - Pann Auto Performance - San Diego largest aftermarket automotive performance parts - What do you drive? Pro-Circuit 2 isn’t a replacement for the original Pro-Circuit but a different option. It adds a little extra height but the main change is how much further the shifter is moved back. This has come under many requests from customers and racers who have moved their seat back and wanted a shifter closer to them. It is also a great option for EK which have a larger dash and when raising the shifter the knob can get very close to the dash. The most noticeable change to our new design is the offset elbow, which is now locked in a fixed position to increase strength, it does not rotate anymore like our original. The new elbow now allows a maximum height setting that is 5” higher than stock. We now use a brass pivot ball and a more stable bearing setup to further reduce friction. The pivot ball is threaded and still allows the user to move it up or down to adjust the shift throw as desired. For construction, only high quality materials are used to ensure the shifter will last even in the hands of aggressive drivers. 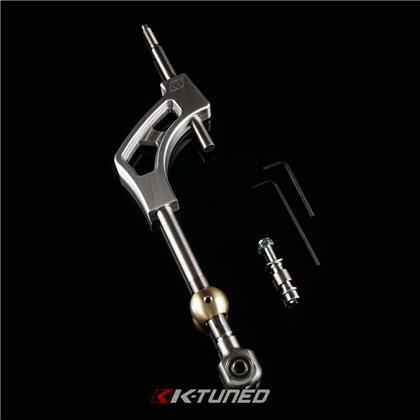 A mix of 100% stainless steel is used on the upper and lower rods, the offset elbow is made from billet aluminum and the new pivot ball as mentioned earlier is now made of brass. Like 90% of our product line, this shifter is 100% North American made as are all the raw materials. All hardware, spacers and allen keys for adjustment are included in our kit. This is without any doubt, the ultimate shifting upgrade for any B or D series engine setup.